Waterproof rain jacket help to keep pets dry and comfortable in wet weather. It can satisfy pets’ needs to walk in the outside when it is rain. Each jacket has a drawstring hood,leash opening,and handy back pocket. 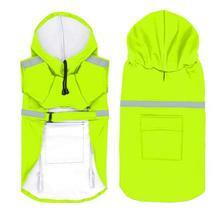 Raincoat reflective stripe on the back ensures pets can be seen at night/in the dark. Dog waterproof rain jacket help to keep pets dry and comfortable in wet weather. The hole design : you can walk your dog with a leash even in the rainy day. I have an 86 pound hound dog and this fit well! Usually things I buy barely fit him, but this was perfect and waterproof!! very cute fashion fair and CARVING super waterproof fabric. very good material i like a.
Raincoat came really fast. Good store. Raincoat is a little tight in the chest-arms area but it's Ok.
Produto exatamente como especificado. Só o tamanho que ficou um pouco apertado, e eu segui as medidas fornecidas pela loja. Fora isso, estou muito satisfeita! Хороший добротный плащ, но не угадали с размером. Надо брать на два размера больше. Малый пудель 40 см в холке. По размерам получается М, оплатил, подумал, попросил продавца заменить на L, все равно оказался мал. Буду перезаказывать на XL. Отличный плащик. Брали на среднюю таксу весом 9 кг. Подошло в ширину свободно, по длине в самый раз, такие вещи и должны быть свободными, не в обтяг. Товар был отправлен сразу, на Алтай прибыл через 10 дней, чему была очень рада, спасибо продавцу!